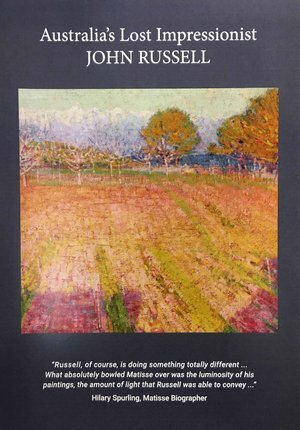 Australia's Lost Impressionist - John Russell is the story of the only Australian artist at the centre of the French Impressionist movement. The film tracks his famous artistic friendships that forever changed the way the world sees colour. John Russell (1858 - 1930) painted in France alongside Claude Monet, he mentored Henri Matisse and became a close friend of Vincent van Gogh. Russell's 1886 portrait of Vincent, now hanging in the Van Gogh Museum, Amsterdam, is well documented as being Van Gogh's favourite portrait. Despite Russell's personal artistic accomplishments and his pivotal role in the development of modern art, his artistic legacy is largely unrecognised outside fine art circles. With the benefit of the 2018 retrospective at the Art Gallery of New South Wales, Sydney, the most comprehensive exhibition of Russell's work in 40 years, the film sheds new light on Russell's life and his experimentation with pure colour. Australia's Lost Impressionist - John Russell features Hugo Weaving as the voice of John Russell. The film brings Russell's story to life through his vivid works and prolific correspondence to fellow artists Vincent van Gogh, Auguste Rodin and Tom Roberts.